This artistic interpretation of the Five of Swords has confused me FOREVER, but I think I finally hit on it! Someone is abusing their authority. I feel brilliant. 😀 Ok, this may have been a no brainer for some, but I’m stoked that it finally clicked, better late than never. Obviously there are nuances that give the meaning of this card more depth and change the interpretation depending on the question, where it lands in the spread, etc, but having the core concept in hand makes the rest a lot easier. If you’re not quite tracking let me explain how I came to my conclusion. The Five of Swords in Rider-Waite-Smith-land talks about competitiveness, winning at all costs, selfishness, narcissism, and the like. The Steampunk version certainly can embody all of that, but the image never quite felt the same to me energetically speaking. In the RWS card there was obviously some kind of fight or dual that happened, somebody won, somebody lost. In the Steampunk card there is no fight going on, not a physical altercation anyway, everything is much more subtle. 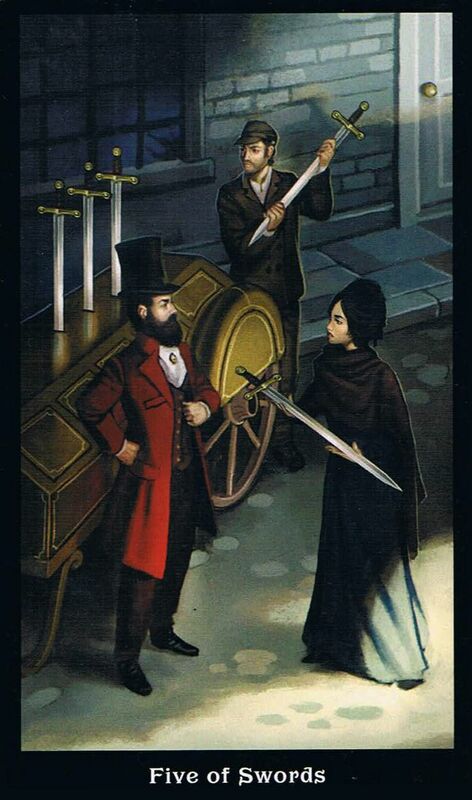 To understand this card I had to ask myself “why are these two individuals handing over their swords?” They don’t look happy about it, so one must conclude that they are being forced or coerced in some way. Obviously they aren’t being physically forced to hand over the weapons. It doesn’t look like they are receiving anything in return either. So what would compel someone to willingly (albeit begrudgingly) give up something that they didn’t want to give up, for nothing in return? Not cool dude. Not cool.